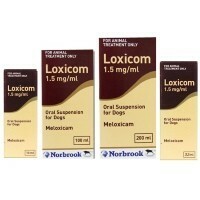 Loxicom for Dogs in an oral suspension containing meloxicam 1.5mg/ml and sodium benzoate 1.5mg per ml. Indicated for alleviation of inflammation and pain in both acute and chronic musculo-skeletal disorders in dogs. Treatment should be given once daily by mouth at 24 hour intervals at a maintenance dose of 0.1mg meloxicam/kg bodyweight (i.e. 0.667ml/10kg bodyweight). If longer term treatment is required the dose can be adjusted to the lowest effective dose reflecting that the signs of pain and inflammation can vary. The oral suspension can be given using either of the two measuring syringes provided in the package. The syringes fit onto the bottle and have a kg-bodyweight scale. I don't think my dog would be still with me, If it wasn't for this. She has been taking them for over two years, and has blood tests to check all is well. Good value from Vet UK - have saved serious money over what I would pay at my vets. Quick delivery, too. Benson our 8 year old Labrador has been taking Loxicom for 6 months for arthritis. It is easy to administer and keeps him pain free and mobile. I would recommend this product and advise purchase from Vet UK as its so much cheaper than getting it from your vet. As I'm a new customer,And it's my first order I can't say to much,but I did expect it to be delivered in a couple of days,I had problems ordering the item due to the prescription or I might of got it soone,so iv ordered another bottle to be signed for in the hope I will get it quicker. I've got a 6 year old German shepherd with arthritis and it puts a spring into her she runs about with her 3 year old sister. I use this with my 7 year old cross-breed. Following a successful cruciate repair he started limping and being lame again and we thought his other cruciate was going. Unfortunately he was diagnosed with severe hip and knee disease which will progressively get worse. Told that Loxicom would be the best course of action and within three days of taking it he was a new dog, full of life and smiles and running around. We've had no side effects so far and when we miss a dose for a day or so we can immediately tell. I hate to think of my dog being medicated for life, but this really is a wonder drug in our eyes and has brought back the Bail that we know.